The Mayor’s Alliance for NYC’s Animals 17th Annual Spay Day was just over a week ago! 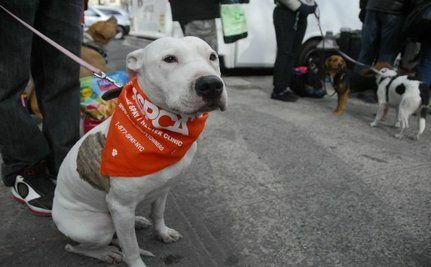 This year they partnered up with HSUS, ASPCA and FreeKibble to bring affordable spay/neuter surgeries, vaccines, microchipping and free pet food to New Yorkers and their furry friends. Below is a video from Spay Day 2011! Check it out to hear grateful pet owners and helpful volunteers sharing their feelings on the importance of spaying and neutering pets to reduce overpopulation. That is AWESOME..wish they would do that here. Going to the Vet here cost to much money$. Rah, rah. I always try to encourage people to get their pets from a local animal shelter. Thank God for intelligent people who believe in spay and neuter!! super dooper news! yeah!!!!!!! thats awsome.....if more people care of spaying and neutering their pet, we can end dogs over population! How awesome! I love to hear stories like this and wish events like this would happen more often and in many, many more cities. Thanks Desirai!